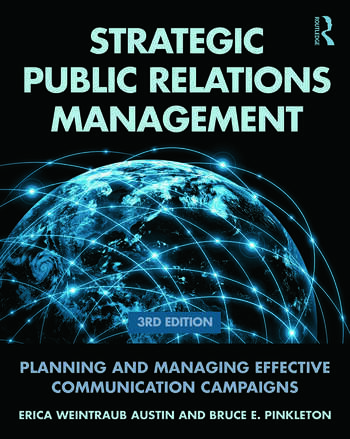 Strategic Public Relations Management features an applied approach to evidence-based, strategic public relations management. It emphasizes understanding audiences through research and demonstrates success through quantitative evaluation methods. The volume presents a scientific approach that helps future and current practitioners understand and communicate the value of public relations to others, using performance metrics to demonstrate return on investment. New examples that provide a more accessible pathway to real-world application. Applying theory to professional practice. The book's accessibility will be welcomed by instructors and students with definitions of terms, a how-to approach, and an accessible style of writing throughout. Part I: Framework for Planning. 2. Where the Strategic Manager Begins: Taking Stock. 3. Elements of the Campaign Recipe. 4. Determining Research Needs: Developing the Research Plan. Part II: Gathering Useful Data for Strategic Guidance. 5. Research Decisions and Data Collection. 6. Making Research Decisions: Sampling. 7. Making Research Decisions: Informal Research Methods. 8. Making Research Decisions: The Focus Group. 9. Making Research Decisions: Formal Research Methods. 10. Making Research Decisions: Survey Research. 11. Making Research Decisions: Questionnaire Design. 12. Collecting, Analyzing, and Reporting Quantitative Data. Part III: Using Theory for Practical Guidance. 13. What Theory Is and Why It Is Useful. 14. Theories for Creating Effective Message Strategies. 15. Practical Applications of Theory for Strategic Planning. Part IV: The Successful Pitch and Follow-Through. 16. Presenting Campaigns, Program Proposals, and Research Reports. Appendix A: Code of Professional Standards for the Practice of Public Relations. Appendix B: Code of Professional Ethics and Practices. Appendix C: Guidelines and Standards for Measuring and Evaluating PR Effectiveness. Erica Weintraub Austin is the Professor and Director of the Center of Media and Health Promotion at Washington State University. Bruce E. Pinkleton is Professor and Associate Director of the Murrow Center for Media and Health Promotion Coordinator at Washington State University.